Don't let the size of this picture fool you. The Dekatama is huge! It is about 4 times bigger than a regular Tamagotchi and has a huge screen and way bigger pixels. What's the point? Well, it's not meant to be played with like a regular Tamagotchi. It's actually meant to be used with the Akai and Ketai Tamagotchis (cell phone Tamagotchis). You can use this thing to rack up TONS of points really fast to be transferred over to your Keitai or Akai. There's also a cute character on it that you can buy furniture and a house and other items for. It's pretty interesting to say the least. 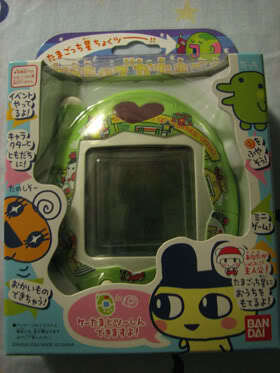 It's also a little difficult to use because it is a Japanese Tamagotchi so everything is in Japanese. You need detailed instructions to figure this thing out. It's so big that it has a stand to hold it up and has a switch to turn the sound on and off. I rarely play with it, but I think it's worth having if you have a Keitai or Akai. NOTE: It does not connect to cell phones even though it has an antenna, oddly enough.